Cisco IOS 15.1(4)M for ISR Routers – IOS Shell Gives Us Nested Grep! Opinion – Network Automation, Build or Buy? 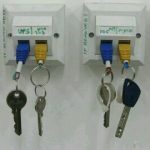 From the Google Plus for Calvin Remsburg check out this EPIC use of the wall patch sockets and patch lead ends as a key minder system for his data centre. Markku Leiniö linked in one of his articles to a new mLACP feature for the Cisco Catalyst 6500, which naturally caught my eye. To create an etherchannel spanning multiple physical 6500’s (desirable to maximize link utilization and for redundancy), you previously needed to use the Virtual Switching System supervisor engine to create a VSS super-chassis….